Tired of having cold tortillas? The Original Tortilla Warmer is the solution for you, its the best tortilla warmer on the market! 100% Microwave Safe. Keep tortillas warm for over an hour. Holds up to 15 medium size tortillas. Machine washable. Easy to store. Tortillero Rojo Calavera Dia de los Muertos de 10 pulgadas. Estas cansado de tener tortillas de frias? El original Calentador de Tortillas es la solucion para usted, es el mejor calentador de tortillas en el mercado! 100% seguro para microondas. Mantenga las tortillas calientes durante mas de una hora. Almacena hasta 15 tortillas de tamano mediano. Lavable a maquina. F�cil de guardar. So easy to use and works great. Now heating tortilla is fast and simple, never dries out, keeps them warm and moist. Put the tortilla in the warmer, no need to add anything, put in microwave, ready in less than a minute. Can't be easier. ProsPut tortillas in warmer, microwave, done. Keeps warm, can't get any better. Cute and bright design. ConsCould be a little bigger but still fits the larger tortillas but have to squeeze them in. i got one of these at Lucky in the SFBA and it is the most perfect item for warming any kind of bread or tortilla. i just ordered three more of these, plus three DOtD pattern, too. seriously, you can put the most rock hard bagel in this warmer and it'll come out soft and nice, plus it keeps tortilla hot and soft for a really long time. at least through your meal! 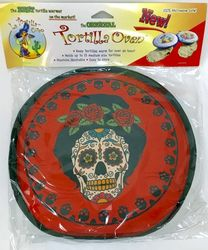 awesome product, and this pattern is really cute and i think La Tortilla Oven doesn't make it anymore, as their page doesn't have it. so glad mexgrocer.com had it!!! Prosabsolutely the best thing for warming and keeping tortillas.